I took Friday off from digging and didn't get back to the site until Saturday afternoon. 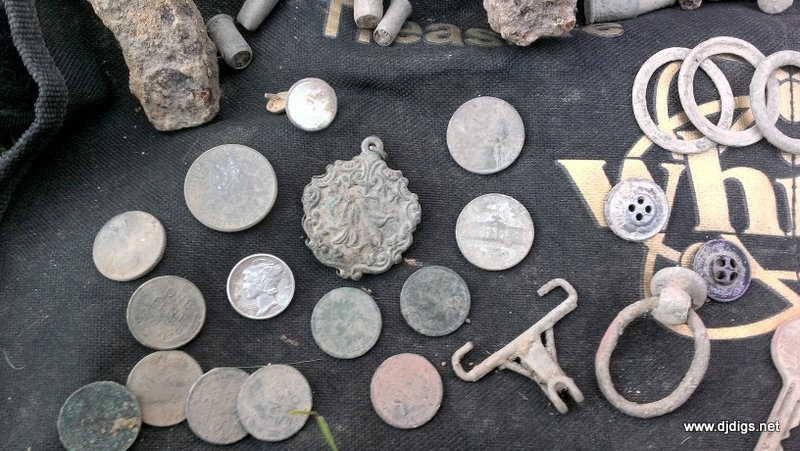 I decided to work the area where I found most of the coins. I was scanning slowly and playing around with different settings on my machine to see what I could pick out of all the iron. 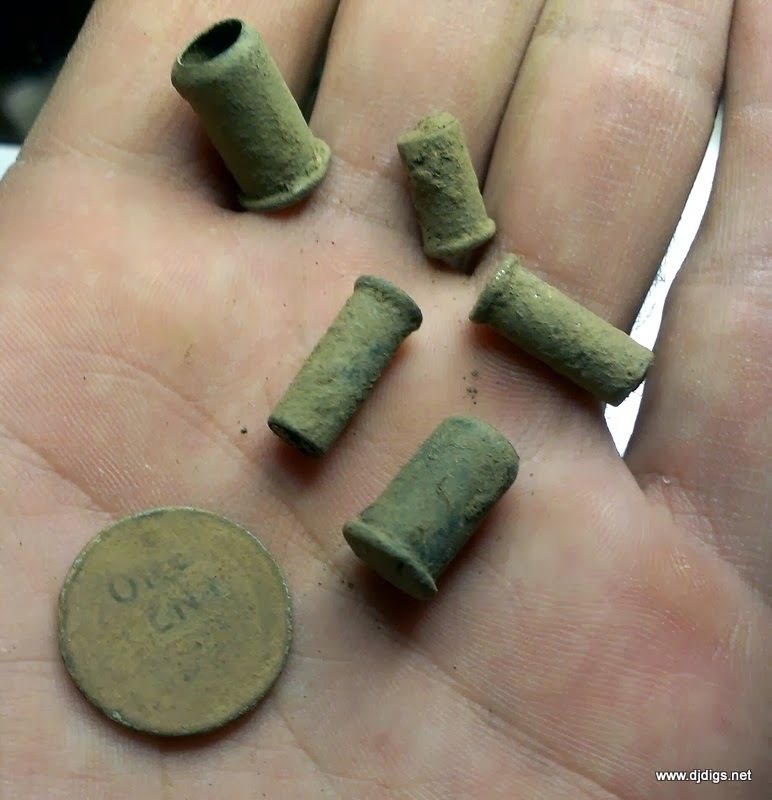 I managed one more wheat penny and a few more .22 shells. 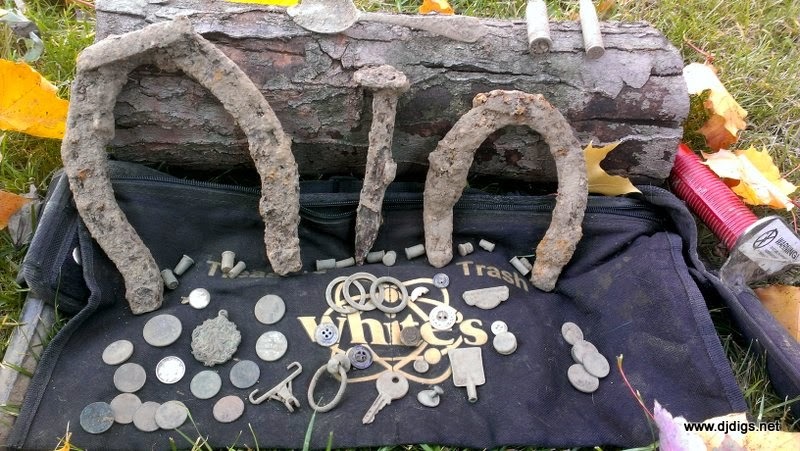 I also found two horseshoes and an iron railroad tie. Then I got a slight but deep signal and I dug a nice old locket. It's in great shape - and it still opens. 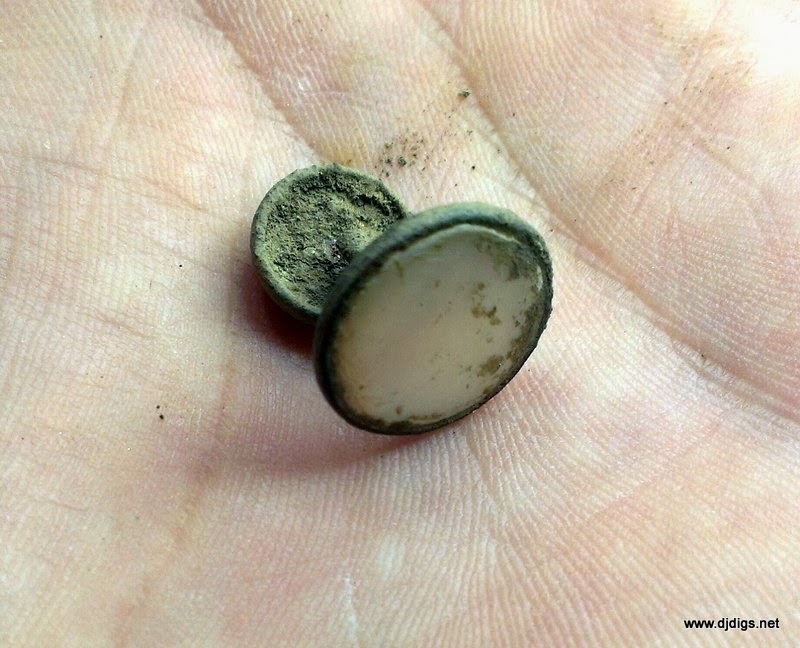 The last nice find turned up an old mother of pearl cufflink. I am sad to say that I broke off the back while digging it out. I was satisfied that I cleared out those dug out areas pretty well, so I began to explore the rest of the property. 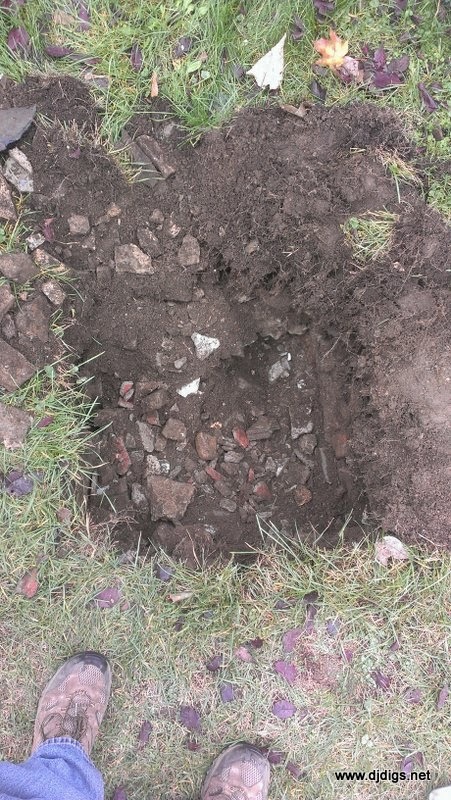 On the backside of one of the outbuildings, I noticed a perfect impression of a square sinking into the ground. I sat my machine down, went to my truck, and grabbed a large shovel. I started cutting out the perimeter of the square impression and peeled back the layer of sod, only to see large chunks of concrete, stone, brick, and even blocks of colored glass. Because of the material, I could tell that it had been filled in within the last 40 years or so. My mind was racing - I was wondering what could be at the bottom of this privy. I was thinking maybe glass bottles. So, I started pulling out the large chunks of material. Before I knew it, I was 4-5 feet deep, sweating, and covered in mud. And then I realized that the property borders a drive-thru window. I'm sure the people who saw me thought I was nuts! I got down to about 6-7 feet, but realized that this was probably too big of a project... so I filled it all back in. At this point, I was exhausted. As I was packing up the truck, covered in mud, I laughed to myself as I thought about asking Anthony to get the backhoe to help me dig out the rest of that privy - ha! So that's the end of my week-long dig. I'm hoping to get back before they lay the stone for the foundation, sometime this week. 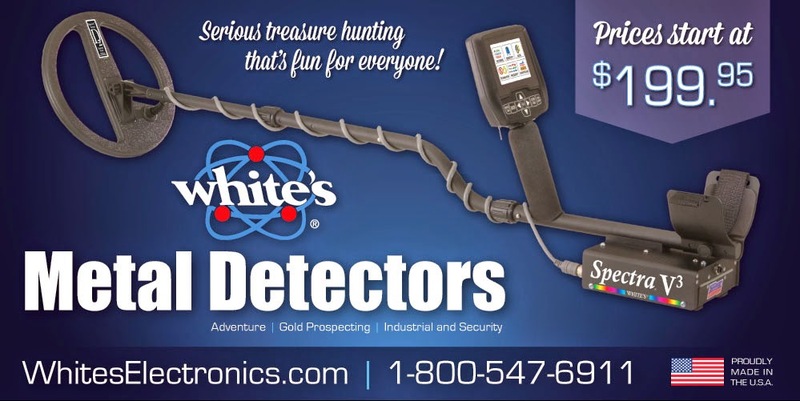 I was hoping to find some Colonial-era coins, but really, it doesn't matter what I found, because I found a new friendship with a bunch of great guys. I was blown away by their hospitality and curiosity. Hopefully our friendship will extend beyond this dig. 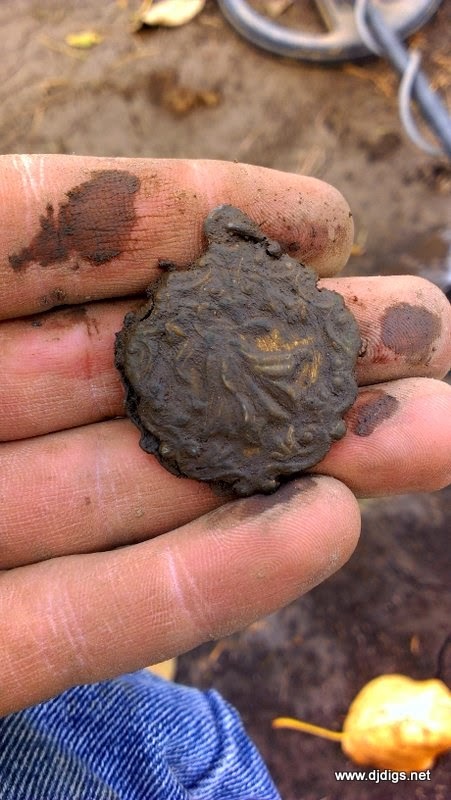 It's not always about the finds. It's about the journey, the experience, and the people you meet along the way.